(Nanowerk News) Researchers have designed a nanoparticle-based therapy that is effective in treating mice with multiple myeloma, a cancer of immune cells in the bone marrow. Targeted specifically to the malignant cells, these nanoparticles protect their therapeutic cargo from degradation in the bloodstream and greatly enhance drug delivery into the cancer cells. These are longtime hurdles in the development of this class of potential cancer drugs. The study, by researchers at Washington University School of Medicine in St. Louis, appears online in the journal Molecular Cancer Therapeutics ("Small molecule MYC inhibitor conjugated to integrin-targeted nanoparticles extends survival in a mouse model of disseminated multiple myeloma"). 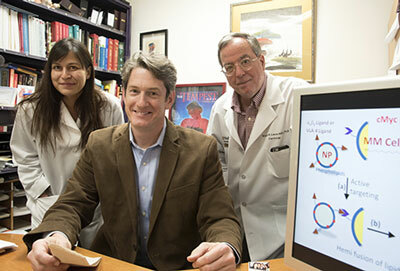 From left are first author Deepti Sood Gupta, PhD, and co-senior authors Michael H. Tomasson, MD, and Gregory M. Lanza, MD, PhD. The nanoparticles carry a drug compound that blocks a protein called Myc that is active in many types of cancer, including multiple myeloma. So-called Myc inhibitors are extremely potent in a petri dish. But when injected into the blood, they degrade immediately. Consequently, the prospect that Myc inhibitors could be a viable treatment in patients has been problematic because past research in animals has shown that the compounds degrade too quickly to have any effect against cancer. The new study is the first to show that Myc inhibitors can be effective in animals with cancer, as long as the drugs have a vehicle to protect and deliver them into cancer cells. When injected into mice with multiple myeloma, the targeted nanoparticles carrying the Myc inhibitor increased survival to 52 days compared with 29 days for mice receiving nanoparticles not carrying the drug. The researchers also pointed out that the potent Myc inhibitor showed no survival benefit when injected by itself, without the nanoparticle. Multiple myeloma is a cancer that affects plasma cells. These cells are part of the immune system, manufacturing antibodies that fight off infection. But in multiple myeloma, plasma cells grow out of control in the bone marrow, crowding out healthy cells. While treatments exist, only about 50 percent of patients with the disease survive five years past diagnosis. Myc inhibitors are thought to be promising treatments for multiple myeloma because they shut down a gene required for cell proliferation. This gene is known to be highly active in multiple myeloma and many other cancers, raising the possibility that strategies to shut it down could be effective against a variety of tumors. For this study, Tomasson collaborated with nanomedicine expert Gregory M. Lanza, MD, PhD, the Oliver M. Langenberg Distinguished Professor of Science and Practice of Medicine, whose lab synthesized and modified a compound discovered by Edward V. Prochownik, MD, PhD, of the University of Pittsburgh. Prochownik has devoted his career to studying Myc proteins and their inhibition. The researchers suspected Myc inhibitors would be a good treatment strategy for multiple myeloma if effective levels of the compound could be maintained in the circulation and delivered to the right cells. Lanza explained that these nanoparticles self-assemble, comparing the process to shaking up an oil and vinegar salad dressing with a bit of mayonnaise to stabilize the tiny particles and the Myc inhibitor in the mixture. Lanza also designed the nanoparticles to carry targeting molecules that home in on and bind to cancer cells that carry the complementary receptor, like a lock and key. When the nanoparticle binds to the cancer cell, their membranes fuse together, transferring the drug to the malignant cell. When safely inside, the drug is enzymatically freed to do its job, blocking Myc from activation. And in theory, noncancerous cells are unlikely to be adversely affected by Myc inhibition because healthy cells shouldn’t have highly activated Myc proteins to begin with, according to the researchers. Tomasson and Lanza said this technology is still years away from being tested in people, but they are optimistic about its future potential and are eager to begin that work.